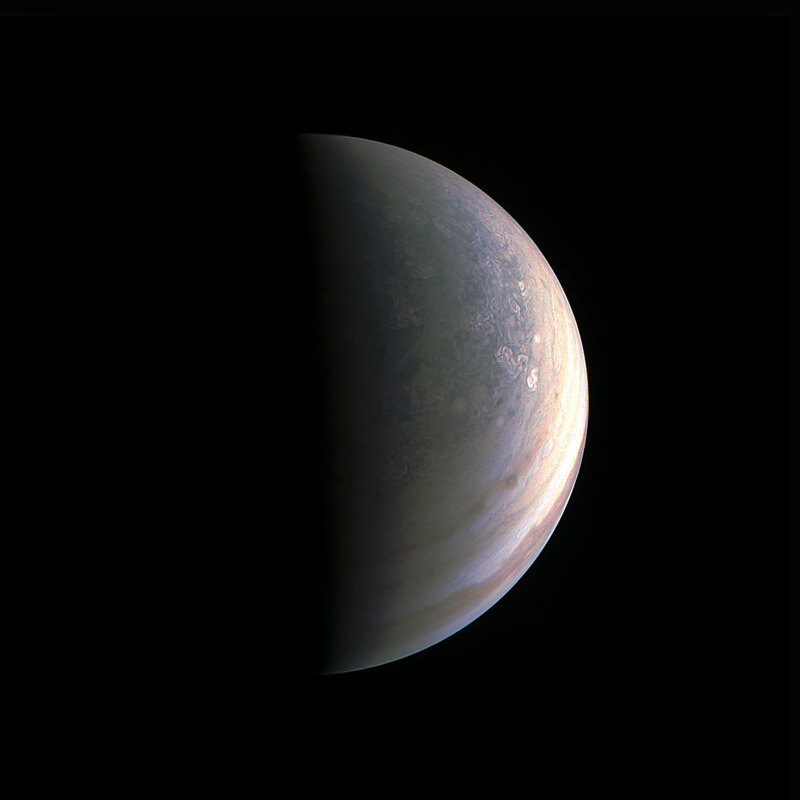 NASA’s Juno spacecraft captured this view as it closed in on Jupiter’s north pole, about two hours before closest approach on August 27, 2016. 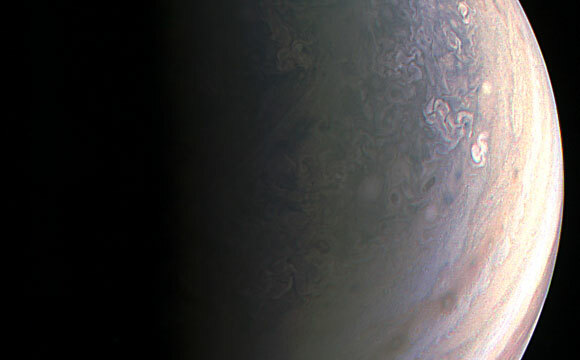 Juno’s recent flyby of Jupiter has provided astronomers with images unlike anything previously seen. Juno successfully executed the first of 36 orbital flybys on August 27th when the spacecraft came about 2,500 miles (4,200 kilometers) above Jupiter’s swirling clouds. The download of six megabytes of data collected during the six-hour transit, from above Jupiter’s north pole to below its south pole, took one-and-a-half days. While analysis of this first data collection is ongoing, some unique discoveries have already made themselves visible. 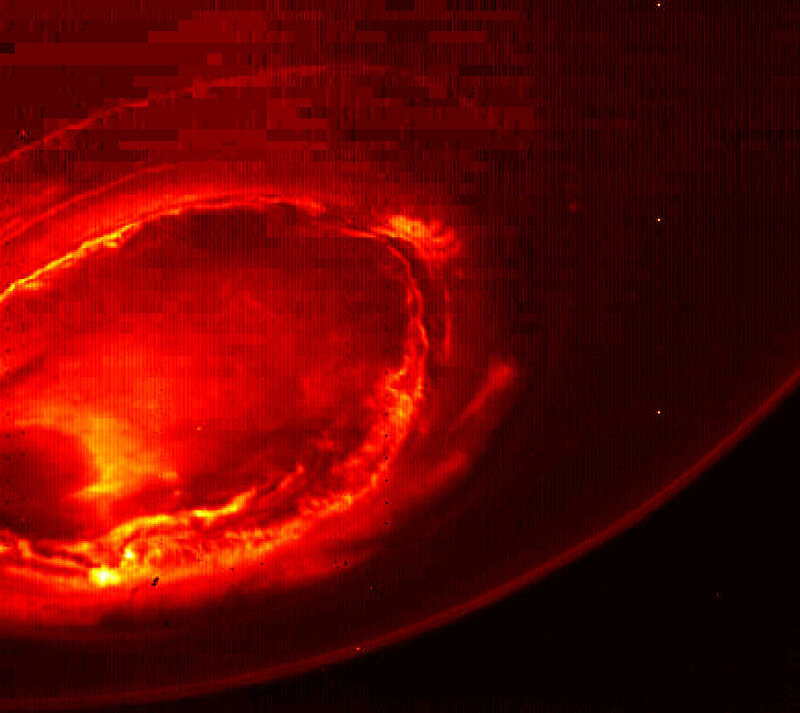 This infrared image from Juno provides an unprecedented view of Jupiter’s southern aurora. Such views are not possible from Earth. Thirteen hours of radio emissions from Jupiter’s intense auroras are presented here, both visually and in sound. The data was collected when the spacecraft made its first orbital pass of the gas giant on Aug 27, 2016, with all spacecraft instruments turned on. The frequency range of these signals is from 7 to 140 kilohertz. Radio astronomers call these “kilometric emissions” because their wavelengths are about a kilometer long. As Juno approached Jupiter on August 27, 2016, it’s Jovian Infrared Auroral Mapper (JIRAM) instrument captured the planet’s glow in infrared light. 4 Comments on "Juno Images Provide an Unprecedented View of Jupiter"